IARC Postdoctoral Fellowships Notification Released! Disciplines Covered are Epidemiology (all disciplines included), biostatistics, bioinformatics, and areas related to mechanisms of carcinogenesis including molecular and cell biology, molecular genetics, epigenetics, and molecular pathology. Interdisciplinary projects are encouraged. Fellowships are tenable at IARC in Lyon, France working in a research Group. 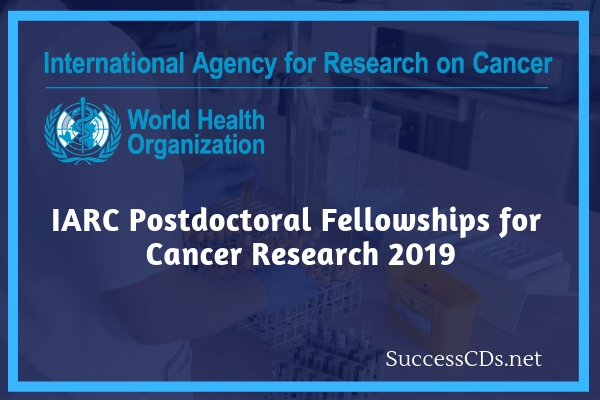 Applicants are eligible from any low-and middle-income country as IARC is particularly keen to promote the development of expertise in cancer research in these countries by training postdoctoral researchers who can return to apply their new skills and expertise. Candidates are required to have obtained their doctoral degree in the 5 years preceding the start date of the Fellowship. Candidates in the final year of their PhD studies are eligible to apply but must have been awarded their degree by the time of starting their Fellowship. The working languages at IARC are English and French. Candidates must be proficient in English at a level sufficient for scientific communication. Candidates currently at IARC as fully-funded postdoctoral scientists, or candidates who have worked at the Agency as a postdoctoral scientist for a period greater than 6 months, cannot be considered. The Fellowship is for a period of 2 years, the second year being subject to satisfactory appraisal. The annual stipend with dependant allowance is competitive compared with other international fellowship schemes. The cost of travel for the Fellow, and in certain circumstances for dependents, will be met, and health insurance covered. Please complete electronically in English. Answer each question. All relevant information should be included on this form but, if necessary, you may attach additional documents.